We need help, we are so thrilled with the way Candy’s Hugs have taken off, she would have been delighted with the number of wonderful women already helped (over 25 now) but we urgently need squares to keep on going at this rate, and we really want to, as we are sure are you. 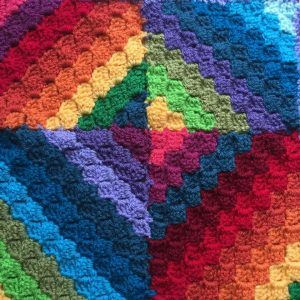 So a little summer holiday project if we may, a perfect lightweight portable activity, perfect for park, beach, plane or car, 6 or 12 inch squares in the colours below – we can help there, just message us if you need yarn to be able to take part, this is an inclusive project! Squares to be 12 inch or 6 inch, crochet or knitted equally welcome, please use 4mm hook or needles. No blocking necessary and please sew in ends, and make sure any colour changes are firmly knotted. All crafting abilities genuinely welcome, squares made by beginner or expert will be equally cherished. Simple, complex, single colour, mixed colour. It really is the love and thought that counts. If you feel ambitious and would like to make a whole blanket, then that is wonderful, we are aiming for blankets approx 48 inches by 60 inches, certainly no smaller. Candy’s Hugs will be an ongoing project, our next collection date is July 15th, followed by Saturday 30th September Do message for posting info when ready. We knew her time left with us was short, but the news of Candy’s (Zombie’s) death in January was still a sad shock, we send so much love to her family and her many, many friends who love and will miss her greatly, we hold our happy memories of her very dear. Bless her. Just before Christmas, Zombie donated funds to Woolly Hugs and together we hatched a plan to develop an ongoing project with her, which she loved, to make comforting cosy blankets with love in every stitch for women going through treatment for breast and other cancers, and at times these may form part of palliative care. Zombie was a bright and beautiful woman so we have chosen a palette to reflect this which we call Vibrant Rio.Will you join with us? If you would like to be involved in any way, we’d love to have you on board. Please post on this thread and PM with your offers: crafting, donating, need wool, etc, we can help you with all of it. We are on Facebook – Woolly Hugs and Twitter too @Woolly_Hugs both are good ways to keep in touch.